Used Audi TT Review - 1999-2006 | What Car? 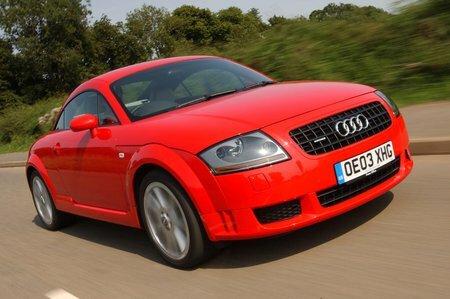 Which used Audi TT coupe should I buy? If you fancy a TT, but are torn between the hard-top coupe and soft-top roadster, the deciding factor may well be what sort of a driver you are. The coupe's roof makes the body stiffer and improves the handling, so it's the only choice for a keen driver, whereas the roadster is better for those who are happy to take things more gently. As far as the trim is concerned, things are easy, as there's no choice - just a single, generous trim for each engine. However, picking which engine is not easy and your choice depends largely on how much money you have. The earliest models, and therefore the cheapest used buys, have a choice of 180 and 225bhp turbocharged 1.8-litre engines, and we reeckon the more powerful is the best buy in the range. That said, the 3.2 V6 that arrived in 2003 is a great engine, particularly with the optional DSG automatic gearbox, and even the front-wheel drive models with 180bhp won't leave you feeling short-changed. There was a face-lift in 2002, but the revised front grille (the only major difference) is almost impossible to spot, so the best advice is to buy the newest car you can afford.